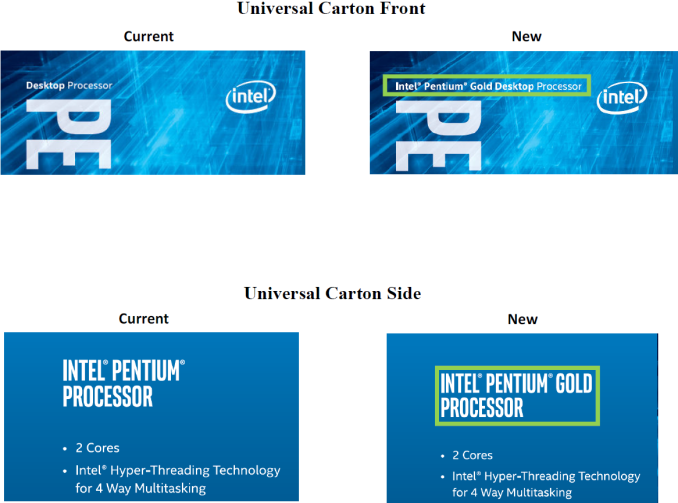 Intel has announced plans to rebrand its current generation Pentium processors, and future generations, to 'Pentium Gold' chips. The rebranding reflects Intel’s intention to position the latest Pentium CPUs above the previous generation parts. Starting from November 2nd, Intel’s boxed Pentium G4560, G4600, and G4620 processors will carry the Pentium Gold brand. These parts were launched in Q1 2017, and are dual-core CPUs with Hyper-Threading technology and an improved integrated GPU. With the name changes also comes a slight branding and retail packaging update. The first is with their “Piggyback label” (included sticker attached to the instructions), which changes from the ‘PCB’ die map as a background to gold. 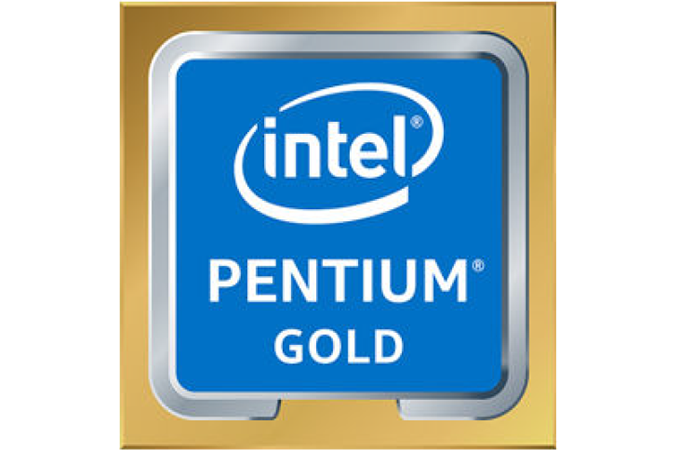 Instead of saying Pentium inside, it now says Pentium Gold with the Intel name above it. There are unofficial reports claiming that Intel is also preparing Pentium Silver products, thus splitting the desktop Pentium lineup into two groups. The Pentium Gold family evidently consists of the mainstream desktop (MSDT) processors based on the high-performance Core-branded microarchitecture. According to some reports, the Pentium Silver lineup will use the ultra-low power (ULP) codenamed Gemini Lake microarchitecture, but we cannot confirm this independently. Yea, they are becoming fairly good CPUs. The Silvermont core in the 22nm Atoms are ~50% faster per clock than the Bonnell/Saltwell cores in the 410/530 ones. The Goldmont core in current generation Atom-based cores are an additional 30% faster than Silvermont. The Goldmont Plus core in the upcoming Geminilake is said to be an additional 30% faster, having 4-wide issue. I'm crazy enough to use a Cherry Trail Atom tablet (14nm Airmont core) as my main work machine. It's fine for documents, just don't try doing big builds on it. I had a 22nm Silvermont Windows tablet that was surprisingly decent to use, although it had a much lower res screen. Not since Baytrail. I have one of those cheap 200 eur Windows tablets with a z3775 (quad core, 1.46GHz base / 2.4 GHz turbo (all cores) and the cpu is pretty good. I mean it's no Threadripper, but for the price I can't complain. It can turbo indefinitely, the battery still lasts for a day of light use as long as you have the display brightness set a few steps below max (almost as bright as max, massively lower power consumption and it's plenty fast for the money (it even has quicksync so you can transcode video extremely quickly). The iGPU is a bit slow and if you are watching a 1080p video on the external display you can't do much on the internal. Asus Transformer something? Very few devices used the Z3775. Most used the 3740 with a slower 1.8 GHz turbo. I loved my Dell Venue 8 Pro to bits even with the stupid 2 GB RAM limit and the insane 32-bit UEFI.